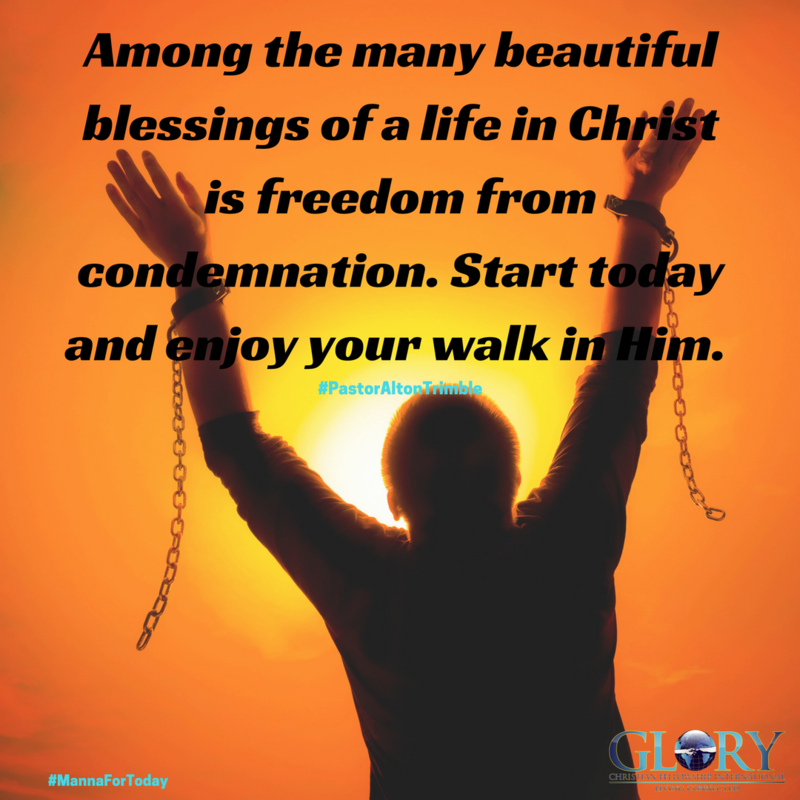 Among the many beautiful blessings of a life in Christ is freedom from condemnation. Guilt is a major challenge that people struggle with daily. The struggle continues in most lives because people remain vulnerable to Satan’s assault on their minds regarding past failures. Now friend, if God chooses not to remember your sins, you don’t have to allow the enemy of your soul to torment you with daily reminders of your past. All we have to do is to not “walk according to the flesh but according to the Spirit.” To walk in this context simply means to have an awareness of what God has told you to observe and do. So, we just find out what God wants us to do in any situation and we do it; that’s walking in the Spirit! Friend, begin your freedom walk today and take authority over the attack to your mind by taking responsibility for what you are allowing to stay there. Cast down anything that is not Christ-like and replace it with the Word of God. Start today and enjoy your walk in Him. God’s Mercy Is New Daily! Overcome Anxiety With Your Daily Confessions! Heavenly Father, help me to cast down anything that is not Christ-like and replace with your Word so that I may receive what you promised, freedom from condemnation and guilt. Help and bless me to walk in Your spirit, in the name of Jesus, Amen. Wow this Manna today is amazing, thank You Lord for giving us a Pastor who is obedient to You and cares for us. Lord thank You for freeing me and family from condemnation. Let us not be vulnerable to the attacks of satan on our minds, we rebuke him in Your powerful and awesome name often and daily. Never let us revisit our past failures and sins so our momentum moving forward is not stalled or delayed. Help us to continually without ceasing walk in the spirit and not the flesh. Let us observe what you tell us to do regardless if it’s popular or not. Let us cast down on the regular anything that exalts itself against You Lord! Continue to let us walk in love serving others because we’re actually serving You! In Jesus mighty and matchless name, Amen! Father help me to help my mind to cast down anything that is not Christlike and replace it with your word God. Help me to also not feel guilty about anything that I’ve done in the past and know that there’s no condemnation in you! help me to forgive myself as well as others. I ask This in your son Jesus name fro my family and friends also. Amen and so it is. God Has Redlivered Me From Myself, His Love, Grace, and Mercy Freed Me From Condemnation, Sin And Death. I Am Set Free In Him In Every Area Of My Life..